My Mom always told me that in needlepoint, the back should look as good as the front. I think it’s safe to say, we can say the same about cakes. The inside should be just as neat (and tasty!) as the outside. Use the thinnest possible layer of fondant, we roll ours to 1/16th of an inch. Your cake layers and buttercream layers should be even. Use a ruler to measure if you have to, we do! 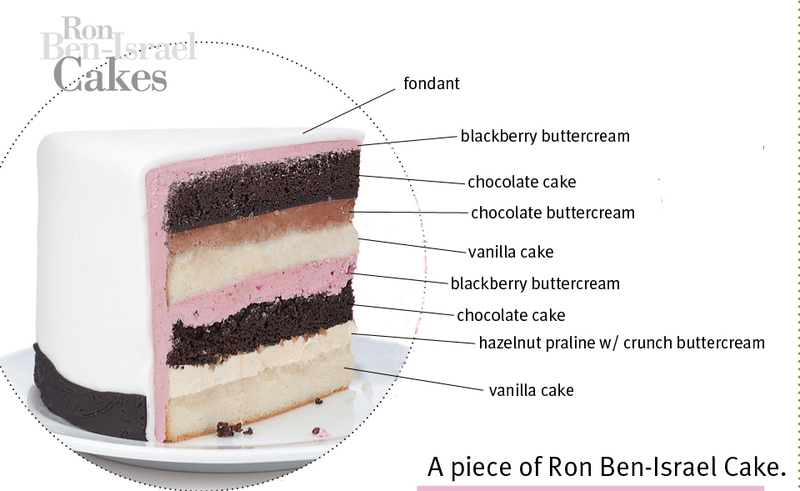 Slice of Ron Ben-Israel Cake shot for Brides (New York edition) Magazine, Summer 2008. I wish I could dig into that right now. Would youmind sharing your Chocolate Cake recipe? I loved your blackberry buttercream one from a few weeks ago. This looks amazingly delicious! How I wish I could go to NY and taste them! Oh how I would love to work there and learn all of those tricks and how to make such beautiful creations…. amazing! One of the things I love is to see the inside of the cake as well as the outside. A piece like this being presented is just as breathtaking as the outside. The presentation is beautiful. ← Sugar flowers, they still amaze me!